Beauty and the Beast is a five reeled game that has 20 wager lines. The game takes players into the fairy tale world of one of the most magical fairy tales, the Beauty and the Beast. This game immerses players into the magical fairy tale theme of the game through the visuals and the sounds that they will be hearing in the background. The game is one of the newest games by Yggdrasil Games to be released into the market. The game is already gaining a lot of traction and popularity amongst the players. This is thanks to its amazing theme, and its visuals, sounds and rewarding features. 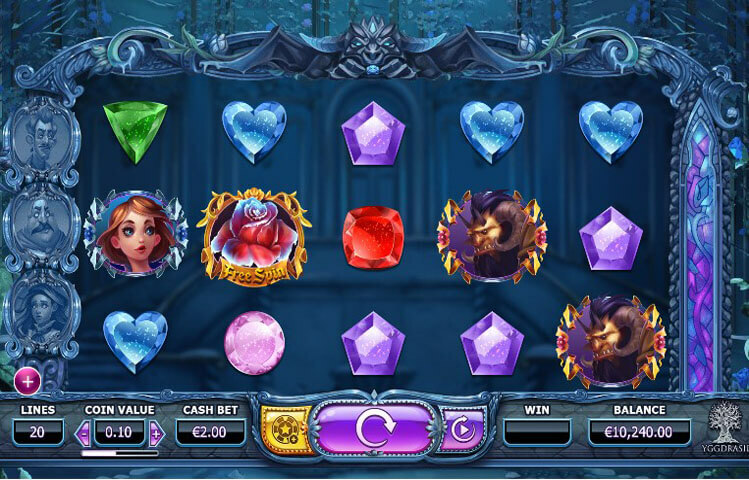 Beauty and the Beast is a fairy tale themed 5 reeled video slot machine that has 20 wager lines. The game is inspired by the fairy tale story of The Beauty and the Beast. In this fairy tale, a princess weds a prince, who is a beast. After she kisses him, she finds to that he was cursed, and when the curse is lifted, he turns into prince charming. The game offers this experience with amazing visuals and sounds. These visuals depict the theme of the game perfectly, which immersed players into the fairy tale environment of the game. The game has an easy to control game play, thanks to the control panel underneath the reels. Players will easily place bets, view the paytable, view their credit and more through this control panel. Players will see that the game is located inside of the mansion of the beast prince. This is why players will see the main staircase of the mansion in the background of the reels. As for the symbols that will appear for players across the reels and the lines, they are inspired by the fairy tale story of the Beauty and the Beast. This is why the symbols include the princess, the beast prince, prince charming, the butler, the maid, precious gems and more. All of the visuals come in great designs to fit the theme of the game for an engaging experience. The game has multiple special icons and features that enable players to claim plenty of rewards. The first of the special icons is the wild. This wild would replace the other icons on the game’s reels to help the players get paid by forming a winning combo. The only icon that it won’t replace is the scatter icon. Speaking of which, the scatter free spins icons can trigger the bonus round of the game that gives the players 10 free spins. Players can also claim cash prizes when they get 4 or 5 of them on the reels.